Old map by DU HALDE - Mandarins, or place-men from du Halde/ Females from du Halde. Title: Mandarins, or place-men from du Halde/ Females from du Halde. Size: 15.0 x 9.4 inches. Condition: In good condition, with slight offsetting only. Good impression. Two copperplate engravings on one plate from Duhalde's 'A description of the Empire of China and Chinese Tartary, together with the Kingdoms of Korea & Tibet. The first shows a Mandarin Tartar, and China Mandarin dressed for war, together with Mandarins of government in their summer and winter clothes. 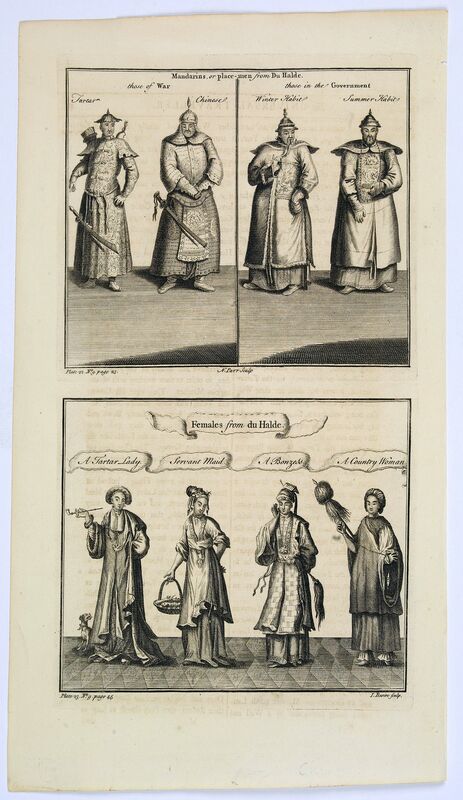 The second shows the attire of four Chinese females, a Tartar Lady, Servant maid, A Bonzess and a Country Woman.